Does Infinity Blade have a new playable character in the form of the Incredible Hulk? A quick glance at the Avenger's Initiative game might lead you to believe this, but is the iPad game by Marvel : Avengers Initiative simply a Marvel themed Infinity Blade wannabee or is it more? The directors of the collaboration between Marvel Games and Wideload Studios would have us believe it is a lot more, billing the iOS Avengers Initiative app as "The mobile gaming event of the year..." . Admittedly the source material in the form of Marvel's rich story universe is ripe for the picking and has been adapted to lots of great games in the past, graphics wise Avengers definitely packs as much of a punch as The Incredible Hulk himself. A wide range of effects and truly massive enemy bosses lend an epic sense of scale to the game. What makes this initial instalment exciting is that the Hulk can be customised and upgraded, a great feature for fans. Content is also episodic so whilst the initial download costs $6.99 apparently the other episodes will be free. So while playing as the Angry Green Giant is exciting updates promised include Captain America,Thor and Ironman will lend a whole different style of gameplay to the app. Gameplay wise while tight, it is here that enormous comparisons between the Marvel battler and Infinity Blade must be drawn, the UI is similar as well as the fighting that takes place, only a full playthrough will reveal whether M.A.I is a homage or a truly great game in its own right. What has been overlooked by many gaming sites is that Avengers Initiative is a "Marvel cross-over gaming event", that particular description taken from the app itself hopefully means that updates, events and new characters to the app will have hints and clues dropped in other forms of entertainment such as Marvel graphic novels and upcoming Avengers movies. What it means right now is that Marvel Xp gained here can also be used in the Facebook game Avengers Alliance, and indeed takes place in the same Marvel Universe. So while it might appear that the Incredible Hulk is now starring in Infinity Blade 3 this game could be so much more if Wideload and Marvel take full advantage of the fantastic fanbase and lore surrounding some of the World's best known SuperHeroes. Ps More good news for Tegra 3 Owners: If your'e an Android loving Tegra 3 owner and still gloating over Horn's graphical superiority to the iPad version (at least in the form of added graphical effects if not overall sheen). 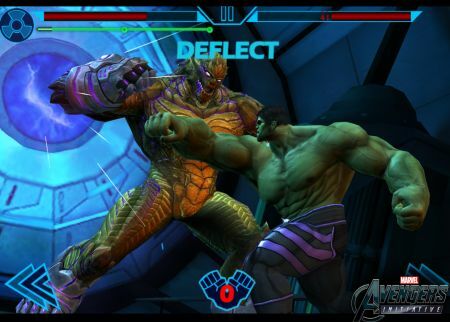 Marvel is seeking to add more to Tegra 3 versions of Avengers Initiative in the form of added Battle Damage.